Mary Bailey-Hatch, a young woman who dreams of seeing the world but is forced by circumstances to remain in her small hometown as head of the family’s Building & Loan business. In a moment of financial crisis, a severely depressed Mary contemplates suicide but is rescued by her guardian angel, Clara Oddbody, who shows her the positive effect she’s had on everyone she’s met throughout her life. 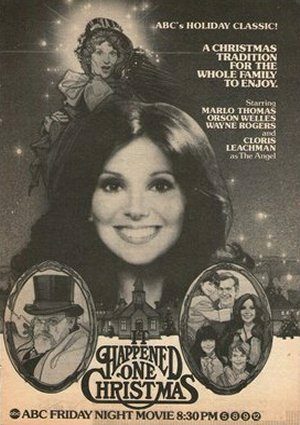 Why won’t the networks air “It Happened One Christmas”? It is a great remake of “It’s a Wonderful life”. Marlos Thomas is great as the main character. in closed-captioned…..I have searched and searched to no avail. Please air….my mom and I have wanted to see these again. They have not aired it for years!!!!! Yes, Linda I have wanted to see It Happened One Christmas also.Remember seeing it years ago.